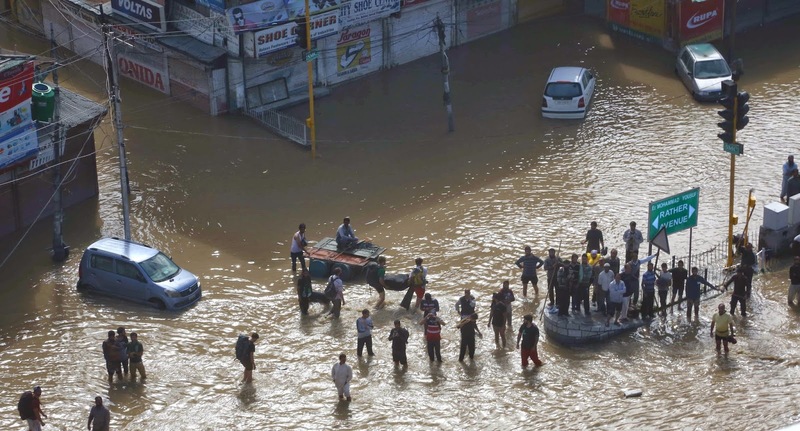 Over 1,25,000 persons have been rescued so far by the Armed Forces and NDRF from different parts of Jammu & Kashmir in the ongoing rescue and relief operations in the flood ravaged State. 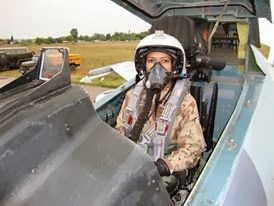 Eighty nine transport aircraft and helicopters of Indian Air Force and Army Aviation Corps have been pressed into service. 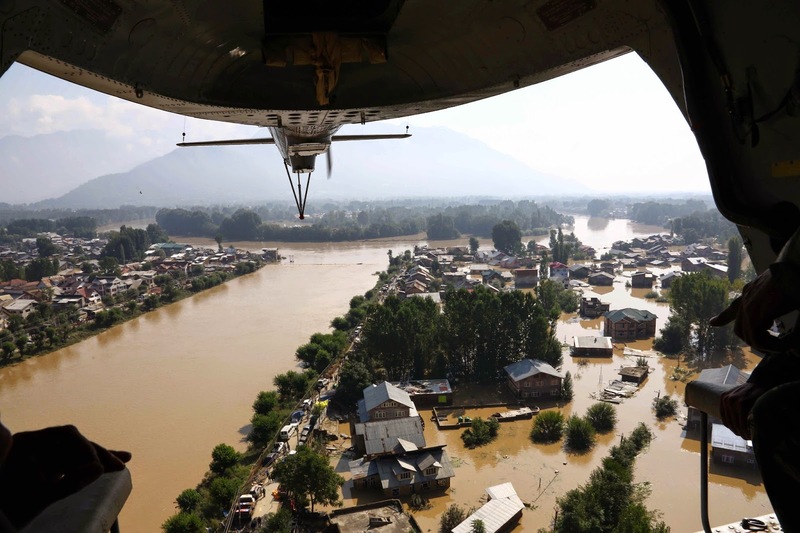 Army has deployed around 30,000 troops for rescue and relief operations, in which 21,000 troops are deployed in Srinagar region and 9,000 troops in Jammu region. Armed Forces personnel are distributing water bottles and food packets on a large scale. So far 2,98,000 litres of water, 31,500 food packets and over 533 tonnes cooked food have already been airdropped and distributed in the flood-affected areas. 8,200 blankets and 1000 tents were provided to the flood victims. 80 medical teams of the Armed Forces Medical Services are already operating in full swing. Four Field Hospitals have been established in Avantipur, Pattan, Anantnag and Old Airfield where medical aid is being provided to the ailing people. Till now they have treated more than 21,500 patients. One more fully equipped field hospital from Bathinda is on its way to Srinagar. 19 tonnes medicines and other health care materials are also being transported from Delhi to the flood affected area. 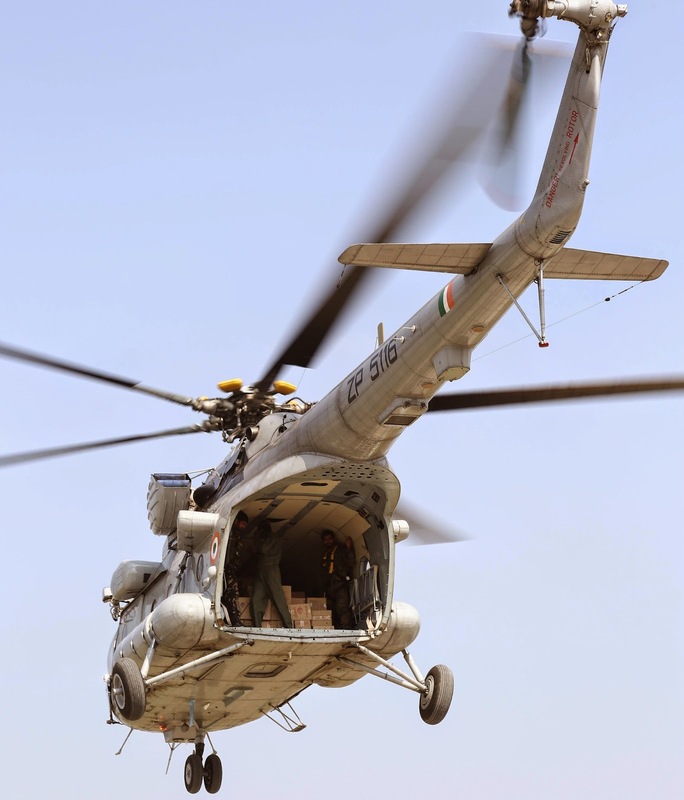 More relief materials including blankets, water bottles and food packets are being airlifted from Hyderabad, Ahmedabad, Delhi, Patna, Amritsar and Chandigarh. 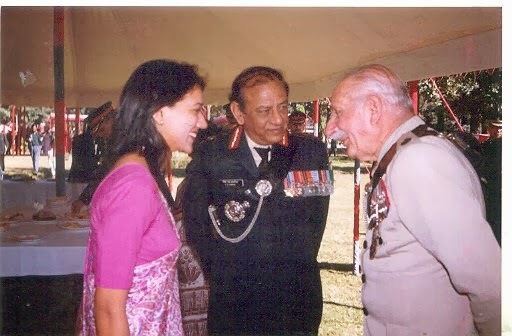 So far 1379 sorties were undertaken by the helicopters and aircraft of Armed Forces. 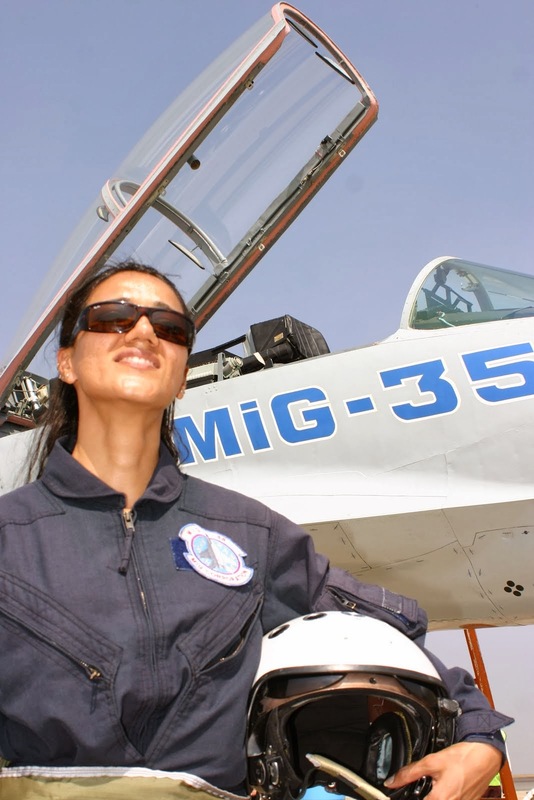 1799 tonnes of relief materials were dropped by the Indian Air Force. 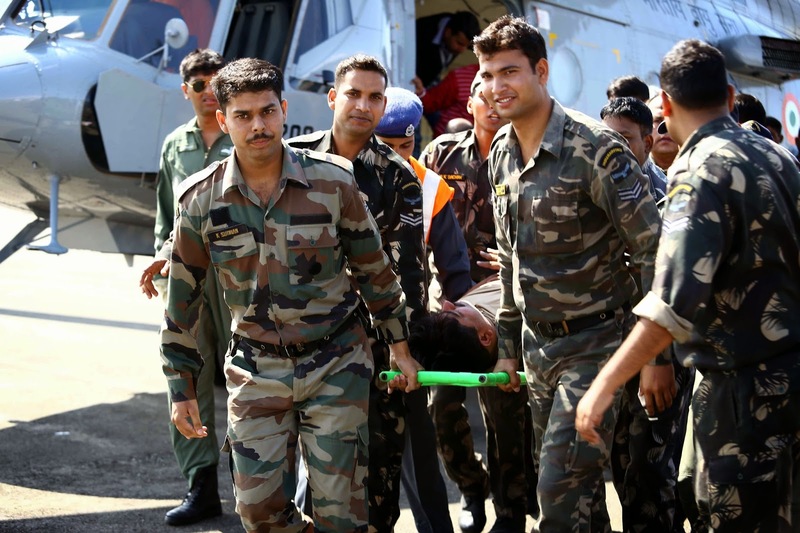 A third batch of Naval Marine Commandos with Rubberised Inflatable Craft (Geminis), Out Board Motors (OBMs), Compressors, Diving sets and satellite phones arrived at Srinagar, yesterday to support the rescue operations. 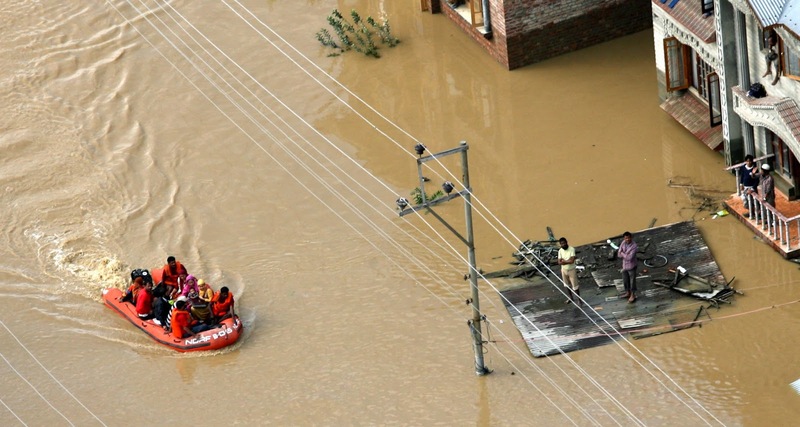 Keeping in view of urgent requirement of more boats in the rescue operation, Army has deployed 90 more boats in Srinagar and adjoining areas. A total of 224 boats of Army and 148 NDRF’s inflatable boats are actively involved in the rescue operation. Thirteen tonnes of water purifying tablets and six water filtration plants with a capacity to filter 1.2 lakh bottles per day has already reached Srinagar. Two water purification plants and 7 lakhs chlorine tablets are being sent today from Delhi. Engineering stores including suction pumps from Vishakhapatnam are also being sent to flood affected area. Communication equipment of Department of Telecommunication, Army, BSNL and some of private companies have been dispatched to restore the communication systems in the State. To meet the immediate energy requirement, 22,000 litres of fuel from Ambala have been transported to the valley. To restore the road connectivity, five task forces of Border Roads Organisation, which include 5700 personnel, have been pressed into service. As of now, they have restored the road connectivity from Batote – Kishtwar, Kishtwar - Sinthan Pass and Sinthan Pass - Anantnag. Jammu - Poonch road has been cleared for traffic. On the Jammu – Srinagar highway, BRO personnel have cleared the road up to KM 172 (Ramsu). 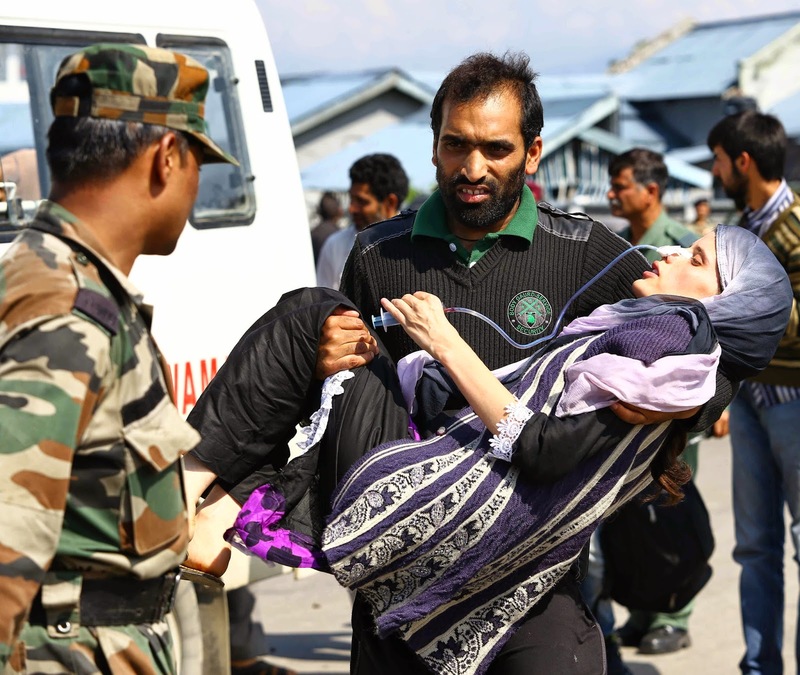 Sept 11, 2014 :Over 1,10,000 persons have been rescued so far by the Armed Forces and NDRF from different parts of Jammu & Kashmir in the ongoing rescue and relief operations in the flood ravaged State. A third batch of Naval Marine Commandoswith Rubberised Inflatable Craft (Geminis), Out Board Motors (OBMs), Compressors, Diving sets and satellite phones arrived at Srinagar to support the rescue operations. 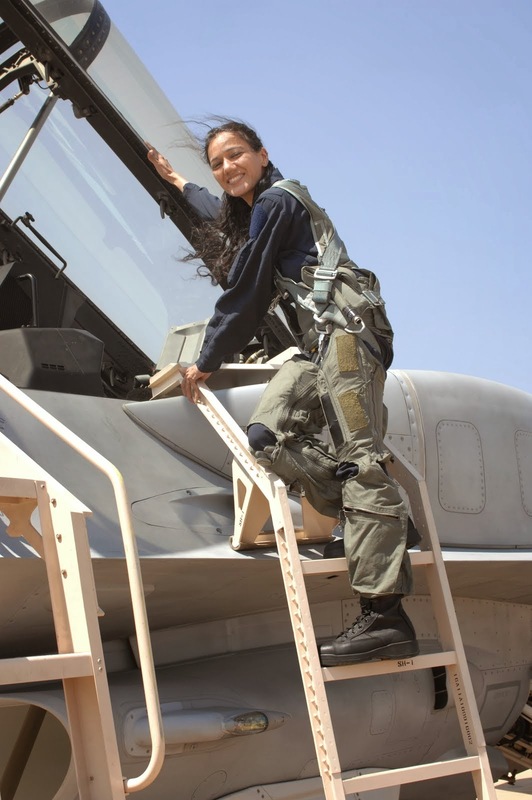 Eighty four transport aircraft and helicopters of Indian Air Force and Army Aviation Corps have been pressed into service. Army has deployed around 30,000 troops for rescue and relief operations, in which 21,000 troops are deployed in Srinagar region and 9,000 troops in Jammu region. Armed Forces personnel are distributing water bottles and food packets on a large scale. 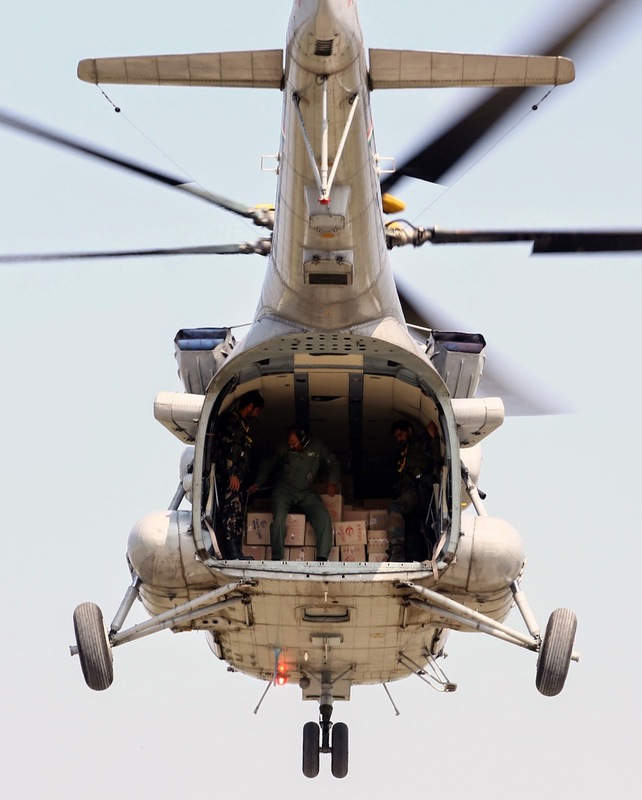 So far 2,24,000 litres of water, 31,500 food packets and over 375 tonne cooked food have already been airdropped and distributed in the flood-affected areas. 8,200 blankets and 650 tents were provided to the flood victims. 80 medical teams of the Armed Forces Medical Services are already operating in full swing. Four Field Hospitals have been established in Avantipur, Pattan, Anantnag and Old Airfield where medical aid is being provided to the ailing people. Till now they have treated more than 21,500 patients. More relief materials including blankets and tents, water bottles and food packets are being airlifted from Hyderabad, Baroda and Delhi. 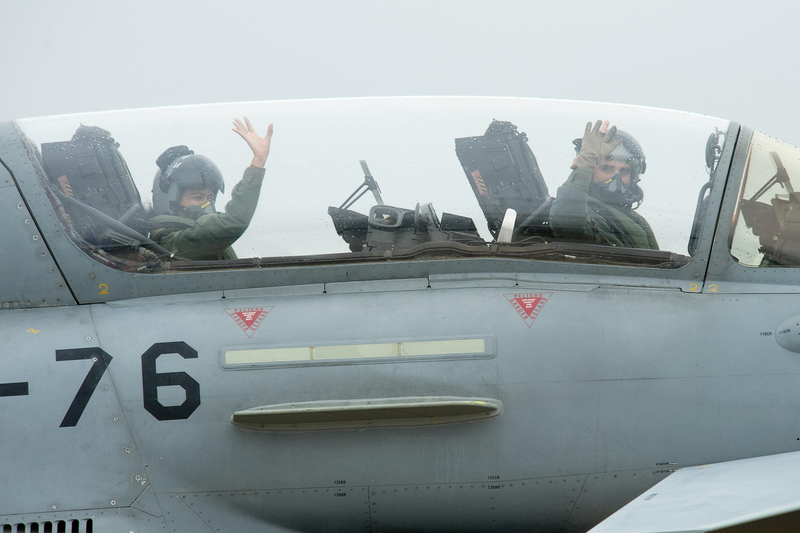 So far 1081 sorties were undertaken by the helicopters and aircraft of Armed Forces. 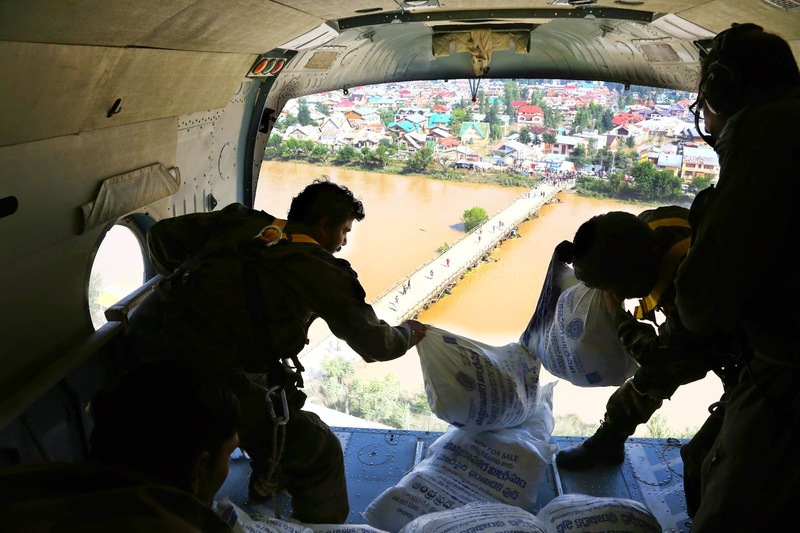 1411 tonnes of relief materials were dropped by the Indian Air Force. 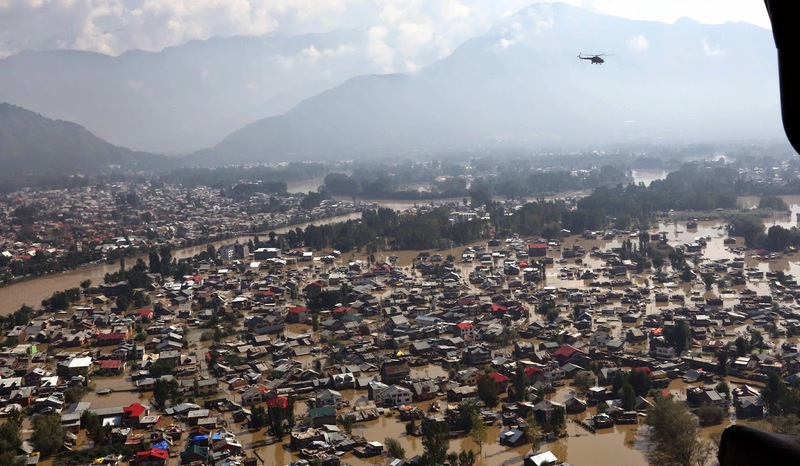 Armed Forces have also established 19 relief camps in Srinagar and Jammu region. 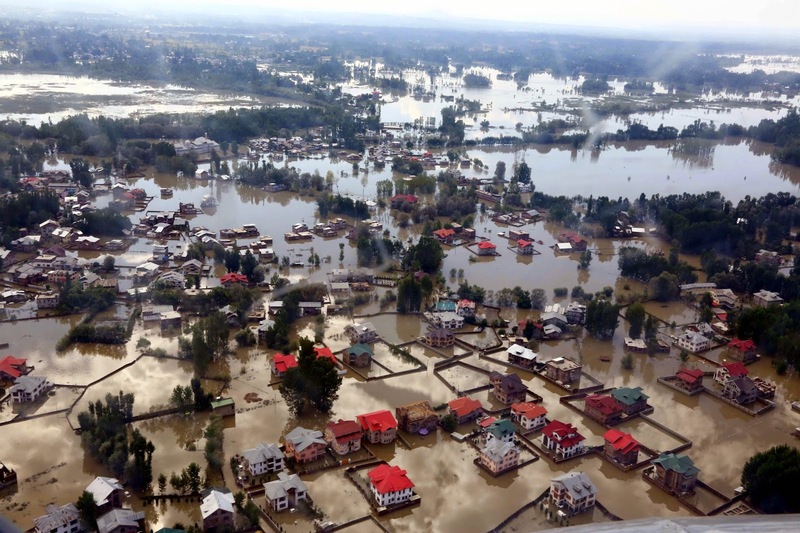 In Srinagar region, camps were established at BB Cantt, Avantipur, Old Airfield, Sumbal, Chattargam and JijamataMandir, where thousands of rescued people are being sheltered. They are also being provided with food and other basic amenities. Thirteen tonnes of water purifying tablets and six water filtration plants with a capacity to filter 1.2 lakh bottles per day is being transported to Srinagar today. Engineering stores including suction and submersible pumps from Vishakhapatnam and Jodhpur are also being sent to flood affected area. Communication equipment of Department of Telecommunication, Army, BSNL and some of private companies are also being sent to restore the communication systems in the State. To restore the road connectivity, five task forces of Border Roads Organisation, which include 5700 personnel, have been pressed into service. As of now, they have restored the road connectivity from Batote – Kishtwar and Kishtwar - Sinthan Pass. Work between Sinthan Pass and Anantnag is now open for light vehicles. Jammu - Poonch road has been cleared for traffic. On the Jammu – Srinagar highway, BRO personnel are trying hard to clear the road blocked by fresh landslide at KM 69 and KM 131.